Gentle daily exfoliation for youthful radiance. Formulated with 5% AHA (glycolic acid), this gentle leave-on exfoliant removes dead skin cells, revealing smooth, radiant, younger-looking skin. This lightweight hydrating lotion improves the appearance of sun-damaged skin, corrects uneven skin tone and minimises fine lines and wrinkles. Usually love your products but this resulted in very sore and itchy skin. I only used it a couple of times so for me, a complete waste of money. Customer Care: We're sorry this product wasn't a fit for you. Be sure to contact our Customer Care for assistance. This is now my daily exfoliant. It makes my skin so incredibly smooth. I've never had an AHA make such a noticeable difference. I've used PC 8% in the past, but I like this so much better. My skin can be a bit combo, so I still use some 2% BHA when I think I need it, but this is great as an everyday exfoliant for me. Oh and I'm loving the pump! I first got the travel size to try it out, and that pump did the thing that lots of pumps do - a little product is left right near the opening, which dries overnight, and then you get what I call the "lotion plug" the next time you use it. But on the full size, the pump seems to somehow stop that from happening. No product is left near the opening. Of course, I can see how this packaging might make it difficult to tell when you're running out. Maybe a little peakaboo strip like the new 10% AHA has would fix that. I'm a huge fan of Paula's Choice products, and am now at the point where about 75% of my skincare regime is from this brand. This is probably one of my favourite products - I use it daily and never let myself run out. It really brightens and smooths my skin; as I use a prescription strength Vitamin-A most nights my skin can occasionally be a bit flaky in the mornings, and this leaves my face clear. With regular use you can really see results. If you have sensitive skin, you may need to give yourself a bit of time to get used to it, but it's worth it. Within one week my skin was looking smoother, and within two it was also clearer and lines are significantly finer. Superior to other exfoliants three times the price. I ordered a sample of this product and I'm on day 5. It has worked wonders already. I've never had such smooth skin. Although I think this product may be a tiny bit strong for me, or maybe it's because I was an AHA virgin before this, I have had some redness and peeling on the tops of my cheeks between days 2-4 but that has calmed down now. I just tried a sample, but I'm very impressed. Whilst still using another Beautypedia-recommended product from other brand, this or 10% one from Paula's Choise is going to my next full-size purchase. No irritation, super light, and good result. In fact, lazy as I am (and also nearly 40 years old:), I'd even prefer stronger AHA to use once or twice a week instead of layering 4-5 products on top of each other. But for AHA-virgins, definitely great choice. After reading these positive reviews I was excited to try this product. However, after using it for the first time last night I have woken up this morning with red, itchy patches on my cheeks. I have quite sensitive/reactive skin so I'm guessing this product is too strong for me. Customer Care: Thank you for your review. Although this is not a common response, we do understand that each customer is uniquely different in how they will respond to products or ingredients. Please contact us for further assistance. After purchasing a whole skincare regime from Paula's Choice and liking them all, I LOVE this product. After cleansing and toning I apply this exfoliant most evenings. It has a wonderful, creamy texture that sinks into the skin quickly and leaves my skin feeling lovely and smooth. A definite must by! Within the first few days of using this product I had smoother, brighter skin, so the actual contents of the product are fantastic. Unfortunately like a number of other customers my pump broke almost immediately and I am now having to screw open the top to get product out. This defeats the purpose of the packaging as I understand it needs to be kept air tight so I'm very disappointed that the pump broke. Please redesign the packaging or I won't be repurchasing what I think is a very good treatment. Customer Care: We have contacted you regarding the problem with the pump. Was so looking forward to using this product after it arrived as I had received a sample of this with a previous order and loved it! However the bottle stated for "Normal/Dry" skin not "All skin types" likes it states on this websites description, image and the sample I received! I have oily skin not normal/dry! Customer Care: Thank you for your review. We would like to assure you that the RESIST Daily Smoothing Treatment with 5% AHA is a product that is indeed suitable for all skin types, however is best for dry skin. AHA products exfoliate cells only on the surface of the skin and therefore is best for reducing signs of aging, including wrinkles, sun damage, and discolorations. I love using this product on evenings when I feel the dry areas of my skin need a little extra attention. Upon waking I am always impressed how much using this improves the condition of my skin. It really makes my skin feel smoother, softer, and more moisturised than it typically does. I was really excited about trying out the 2 Resist formulas, having spoken to the customer care staff. So after placing my order (which wasn't cheap) and waiting for my products patiently...I was really excited to use my products as soon as I received them. That evening I go to use my Daily Smoothing Treatment...I pump - nothing. I pump again, still nothing, after 5 minutes of twisting and frantically pumping, I realised that I'd received a faulty pump, meaning that I can't get the product out unless I turn it upside down and leave it like a ketchup jar. After dropping £55 on buying the products, I wanted to use the products as soon as possible, worse still I've logged on to see that this product is now out of stock....not the best introduction to Paula's Choice products for a first timer....oh well....waiting to see what customer service will suggest. Customer Care: Thank you for your review. We are sorry to hear of the pump of this product. We will contact you to discuss how to solve this issue at the earliest. For the first time in years my skin has improved dramatically, is glowing, smooth and the pores are reduced. I have learned so much from the Beautypedia reviews and now avoid fragrance, alcohol and other irritants. I love this brand because there is actual research behind it and my results are confidence inducing. Please do not be put off by a few customers complaining about the prices; sure they are high compared to the US but I fully appreciate the currency difference, VAT, customs charges etc that have led to the price. The products are great and I am grateful we can buy them in the UK. I have also noticed as well that UK made products are expensive in the US so it cuts both ways. Please don't let a few complainers cause this brand to pull out of the UK or we all loose. After all I have used so many more expensive brands which did my skin more harm than good, paulas choice is cheaper by comparison and actually works. I am satisfied and will continue to pay the price because I appreciate what I am getting overall! This is the best day cream I have ever used and I will not be looking for anything else ever. I am on my second bottle now, that I had ordered few weeks before I finished the first one (which never happened before). It sinks into skin immediately and leaves the skin soft and plump. My skin loves it, I did not experience any peeling or itching. My bottles did not break (mentioned by few users) but I agree that it was difficult to asses whether it was almost empty or not. I use it with weekly resurfacing treatment and can not find anything that speaks against this product or the whole resist range. Truly fabulous product that will be staying with me for a long long time. I really love this product - I am using a full resist regime and this is my favourite of the lot - it absorbs very quickly and leaves my skin feeling both silky and soft. That said, as with all the PC products I have I am a little frustrated by the packaging - it's flimsy and as it's not clear, hard to know when the end is near (more frustrating given PC only available online). It's also frustrating to see the price differential between the UK and USA sight - USA prices much lower (addition of VAT does not adequately explain this) and free postage over $50. I am genuinely pleased with the products and just wish I didn't feel a tad ripped off! Customer Care: Thank you for sharing your concern. We would like to highlight that the US retail price is exclusive VAT and other import duties or taxes which may apply. The price mentioned on the UK website is inclusive of 20% VAT. Also the shipping costs from the US (the free postage is for US customers only) are substantially higher than the European postage. There are various unavoidable regional factors which impact the price of products sold in a particular region. VAT & ongoing regulatory fees are just a few of them. These impact the final price which the consumer needs to pay. For Europe, the costs of compliance with EU regulations and EU testing policies have gone up and continue to increase. Also prevailing economic conditions in Europe and US make currency rates extremely volatile which in turn impacts the cost of imports. When you take all these into account, we feel you will benefit by buying from your PC UK web-shop. Jay - First AHA that works! I've used AHAs before and this is the only one that has ever worked for me. I bought this after the BHA 2% liquid, failed for me, and i don't regret it. My skin is alot smoother, hyper pigmentation marks (along with Resist Skin Hydrator) have reduced significantly so tone is now alot more even. I did make a mistake and got to cocky and started using this twice a day, all this did was to cause acne, so i reduced it, and my breakout subsided. Now i use a 1% BHA lotion on alternative days, and use this AHA treatment instead once a week. Through this i have found a perfect harmony for my skin, and i wish i took before pictures so i could compare it now. I think this is a wonderful product. It goes on easily and sinks in well. I dislike silicone base and this has a more watery base which gets absorbed easily and quickly. Also helped my melasma. Not a quick fix but I see that it is peeling the old sun damage spots away. I also noticed great improvement in my skin appearance as I used to get spots during ovulation but these are not small and not so angry. Lovely. Will use for a long time. I bought a sample of this and was going to buy it as I really liked it but I ended up on the US site by mistake, this is only $26 in the US which is roughly £17, why is it so much more expensive in the UK, it has put me off buying the product as I feel I am being ripped off.Customer care: We thank you for your feedback and expressing your concerns. The prices on the EU website include VAT (which averages at 19% in the EU) and that no other import duties or taxes are payable on delivery of the goods. Prices on the website of Paula’s Choice USA are exclusive of VAT (which is payable on importing the goods in the EU) and any other import duties or taxes which may apply. In addition, for Europe, apart from a general rise in costs, the costs of compliance with EU regulations and EU testing policies have gone up and continue to increase. Through her ongoing research, Paula Begoun is continuously fine-tuning and updating her line to be sure each and every product contains beneficial, cutting-edge ingredients that provide distinctive benefits depending on your skin type and needs. It is her goal is to continue to offer the best possible products available. Please be assured that as a customer of Paula's Choice you get the advantage of superior, well-researched products that are still remarkably affordable and we will continue with our special offers. How should I alternate using Resist Daily Smoothing Treatment with Resist Weekly Resurfacing Treatment? Resist Weekly Resurfacing Treatment is recommended for use at night, at least once but up to 4 or 5 times per week depending on how your skin responds. Since we do not advise using other exfoliants at the same time as Resist Weekly Resurfacing Treatment, you can apply Resist Daily Smoothing Treatment as part of your morning skincare routine or on night(s) you do not apply the Resist Weekly Resurfacing Treatment. In the morning, if desired, you can apply Resist Daily Smoothing Treatment after cleansing and toning or you can limit use of the Daily Smoothing Treatment to nighttime (this is best for first-time users). For daytime, follow with a serum and/or moisturizer or foundation rated SPF 30 or greater. 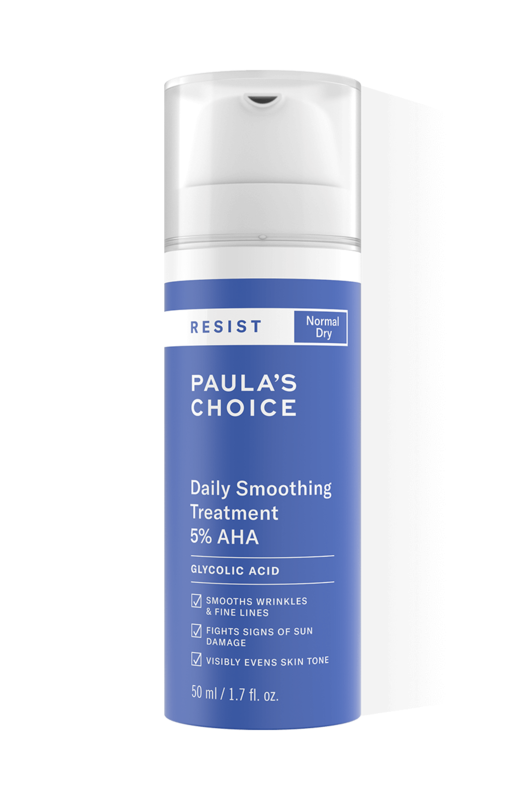 Can I use Resist Daily Smoothing Treatment at the same time as one of Paula's Choice BHA products? Yes, but ultimately it is not necessary to use an AHA and BHA exfoliant at the same time. Exfoliation is a balancing act that requires not tipping the scale so the potential for irritation outweighs the benefits. Using multiple exfoliants at the same time increases the likelihood of irritation and doesn't necessarily provide greater benefits. If you'd like to use a BHA product and Resist Daily Smoothing Treatment, we recommend applying one in the morning and the other in the evening. Which one you apply when is a matter of personal preference.